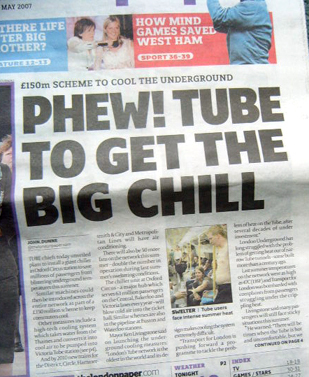 London Underground must have been cursing the timing of yesterday's plans to install a giant chiller in Oxford Circus, when we've had an incredibly cold Bank Holiday weekend with claims that Britain was colder than the Artic Circle. The chiller unit at Oxford Circus – a major hub which serves 63 million passengers on the Central, Bakerloo and Victoria lines every year – will blow cold air into the ticket hall. Similar chillers are also planned for Euston and Waterloo stations. London Underground has also been working with Tube Lines and Metronet to upgrade the existing station ventilation fan network. 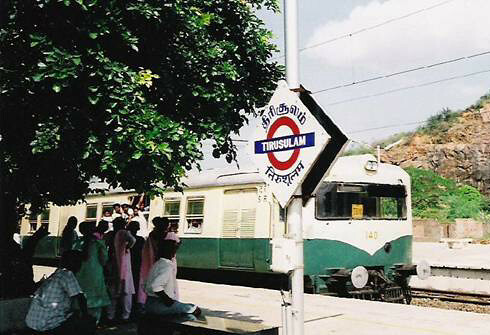 50 fans, which had been allowed to fall into disrepair, are now back into operation – doubling the capacity of the fan network and apparently giving us cooling benefits at a number of stations across the network. Additionally temporary portable industrial fans will be trialled at Seven Sisters and Chancery Lane stations this year to increase air circulation and if successful will be rolled out to a number of stations in 2008. 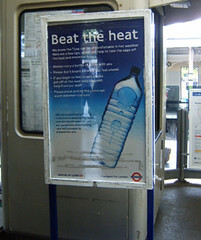 But this still means we're being given the classic "hot weather advice" from TfL "Carry a bottle of water with you and, if you are feeling unwell, contact a member of station staff who will be able to help. Water will be available to passengers if it is needed." Last summer temperatures on the Tube were as high as 47C (116F) and a bottle of water doesn't feel like the ideal way to tackle that sort of heat. Check out Undergroundcooling.net a newish site which aims to "bring coolth and relief to overheated travellers and workers worldwide, on the Subway, The Metro or the Tube. We hope to 'hear' from people from around the world with ideas to make life easier for those of us who have to venture into the bowels of the earth to earn our daily crust." Coolth is not a typo but appararently the opposite of warmth. The site looks like a place to get heated without getting er... heated. "Political Panjandrums and even those who have never suffered the merciless heat and crowding of a subway in summer are also invited to have a say. Silly and 'off the wall' ideas are welcome." Apparently Mike Read the Smashy / Nicey DJ, former Top of the Pops presenter and all round Cliff Richard impersonator has made an unofficial shortlist of Tory candidates standing as Mayor for next year's elections. Infamous nightclub owner Peter Stringfellow is also thinking about it. Neither have been particularly forthcoming about their transport policy. Mike Read said that bendy buses are a "crazy" idea as they clog up roads and that the congestion charge is "unfair" on people who forget to pay. Stringfellow isn't as developed as Read with his thoughts yet and only said "I feel so strongly that Livingstone has to be stopped from destroying London with his mad schemes that I have been giving a lot of thought about running". In the unlikely event of either of them becoming Mayor I wonder what this would mean for the Tube. Of the two I'd be more in favour of Read, as I hope that he'd be leniant on people who "forget" to pay for a ticket on the Tube. He might also think that tourists are a crazy idea as they clog up the wrong side of escalators. I imagine he'd probably kick Johnny Vaughan out of the Covent Garden lift voiceover gig and take on all the announcements himself. Then again if Stringfellow came on board, he'd find it hard to stop himself putting poles to good use in non peak periods. Instead of buskers I'm sure we'd see more raunchy entertainment a la the subway pole dancer in Milan. Any other celebrities who you'd like to see stand against Ken? What do you think they could offer to the London Underground? 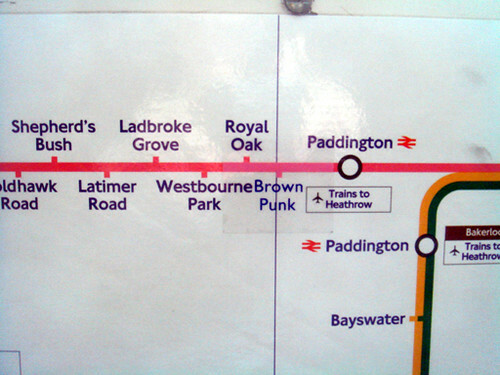 Many thanks to Tom L who sent me the following picture and said "Whilst travelling on a Hammersmith and City line on the 19th May (which was incidentally retired 4 stops later due to 'brake defects') I noticed that somebody had added a new station, called 'Brown Punk' to the line on the in-carriage line maps, between Royal Oak and Paddington. It seems a bit elaborate for graffitti. 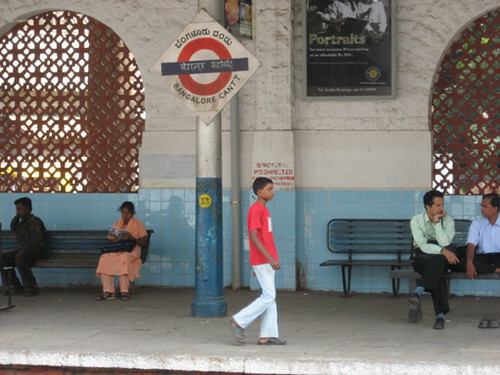 Some kind of subversive art perhaps, or a new station thats been well-disguised?" Any ideas? Or will this be like Brooke Shields' Alphabet graffiti and remain a mystery? A month or so ago, I mentioned Twitter in passing, as Tom Morris had created a London Underground feed for it. Now seems to be a good time to mention it again, firstly because I've got into Twitter a bit more and it's one of those things that you'll gradually begin to hear more people talking about (the FT even mentioned Twitter on its front page). Secondly because Tom's Tube Twitter feed is working again after TfL revamped their website. In a nutshell, Twitter lets you tell everyone what you're up to in 140 characters, from either the web, IM or your mobile phone. You can also "follow" people or add friends and catch up with their various goings on (good way of finding out what people are having for breakfast if you're that way inclined). Thanks to Tom you can stalk your Tube line. He said: "Every fifteen minutes, my server will check the Tube status and send any delays to the relevant Twitter accounts. You can then quite easily subscribe to individual Tube lines and get updates via whatever means you deem appropriate as you would as a Twitter user. A neat side effect of this is that there is now Atom and RSS feeds for each Tube line which you can subscribe to and get these updates sent directly to your RSS reader too. Twitter can also serve as a historical home for Tube problems from now on." BTW my twitter account is here. As I'm not (quite) addicted to it yet, it's mostly updates on when I go to pilates, what I'm having for dinner/lunch, but also will give you a tweet with any other random thought I have. Was this a stage direction? Perhaps some filming taking place that we didn't know about. Or maybe it was addressed to some other kind of artist on the Central Line? Either way, it was very well caught by Loopzilla. Eagle eyed visitors to the blog have spotted some more Tube roundels not in their natural homes on the Tube. He said that the whole window had Tube lines running across it as well. 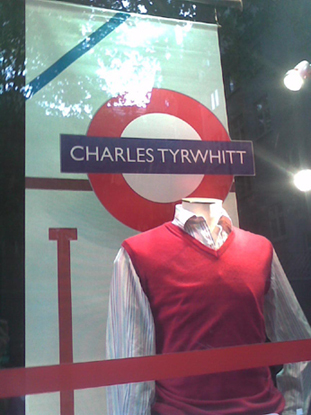 I'd be surprised if Charles Tyrwhitt hadn't got permission from TfL to do this as they're a reputable brand, but you never know perhaps the Tube's lawyers will be paying a visit. the store and some Tube maps with no station names." Callum says "Not sure if the Tube roundel is common on Indian railways, but if it is, then TfL only has to sue the second-largest organisation in the world (after the Chinese army....)"
Anyway, keep sightings of the roundel coming in and I'll add them to the Flickr set. Thanks again to Callum, Allan and Michael for the latest round. No more leaves on line? 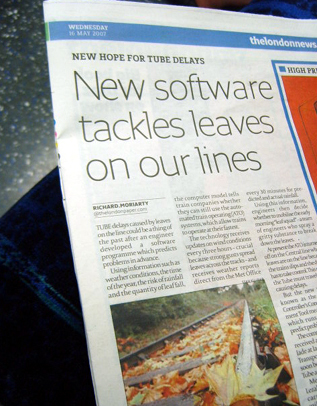 We could be seeing an end to the age old problem of dreaded leaves on the lines causing Tube delays thanks to some nattily named software. The Adhesion Controller's Condition Assessement Tool (try saying that after a few beers) "calculates the likelihood of leaf fall problems, by examining data such as the risk of leaves falling, the quantity and condition of leaf litter and the resultant leaf litter mobility, moisture levels, and a real-time update of general weather conditions – in particular those which lead to light rain and moisture." Not sure what would happen to the software if there was the wrong type of wind, or wrong type of rain, or stickier than usual leaves though. But even when bad weather is predicted will anyone from London Underground take any notice? Remember the very accurate snow forecast that still caught the Tube out earlier this year. Engineers will still have to decide whether to mobilise early morning "leaf squad" - a team of engineers who spray a gritty substance to break down the leaves. 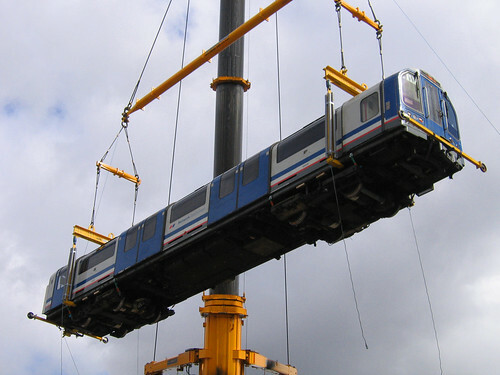 ACCAT will initially be used on the Central Line "70% of the 74 km Central line is in open sections where leaf fall is a continuous threat to the smooth running of the line during the autumn 12-week period from October to December. 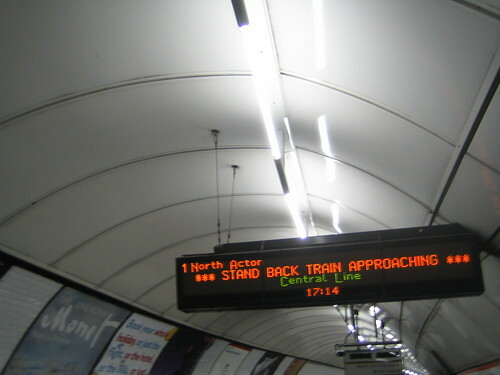 However the predictive system may be extended to the Metropolitan line, and mainline train operators have expressed interest in using the system as well. Have a guess at where it is (easy if you search), but more importantly any guesses as to who or what Stanley Hunt Ltd did or do? And just in case that's too easy. 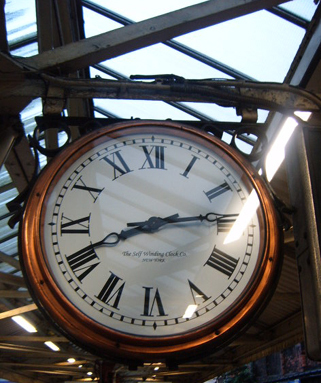 Where did I take the picture of the following clock? 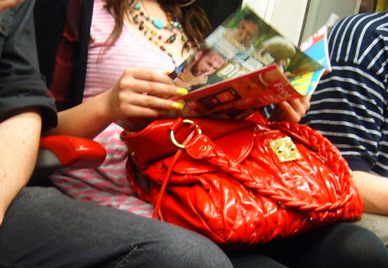 Is it possible to relax on the Tube? Apparently the UK has the longest average daily commute in Europe - 45 minutes. Rather than this being the cause for stress some researchers have suggested that we try to embrace our commute and use it as a chance to unwind. Thanks to Matthew K for giving me the heads up to a feature from the BBC, which states that "for some, having a regular slot away from the pressures of home and work allows them time out to meditate." Does any of the above work for you? Or would you like to share alternative commuting meditation or mantras and positive affirmations you use? "A couple of weeks ago I was waiting for a tube at Whitechapel when the oddest train pulled into the station. It was much lower than a normal tube, the carriages seemed the right height but it appeared to be running on smaller wheels, so the doors sank below the level of the platform. It was about 3 carriages long and inside there was a kitchen, some seating/sofas and what appeared to be lots of storage. I'm guessing that this is a mobile unit for drivers/line workers to rest/have a cup of tea - anyone know?" 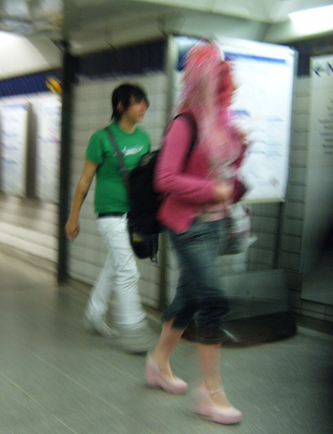 It's Friday's look at Tube Fashion Victims, TFV's or commuters spotted on the Underground where the fashion police should have been following them, or those who've got a distinct sense of err style. First a guest spot from Michael W, who said "Some very strange dude, I'm hoping it was a fancy dress party, but in a leather top, collar and wrist spikes and very tight blue pants looked v.dodgy!" I think he's a builder though, that's if the bucket with the blue bag inside belongs to him. The shoes look like worksite boots, but I'm very puzzled about the blue harnessy / lace up thing he's carrying. Any other theories? I'm not sure if you can buy ankle Uggs, or if these have just been forced down by her jeans. 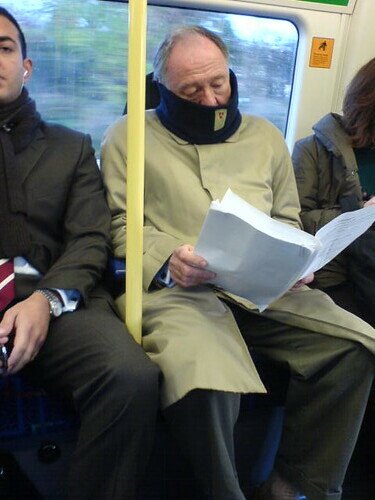 Excellent picture by Sergio Montini who spotted him behind his snood. Sergio says he spots him almost every day on the Tube now. Which I reckon is something you wouldn't be able to say about many celebrities. Or is it? I used to see Rob Brydon fairly frequently at Richmond and I still see Geeta / Gita out of EastEnders & Jack Doherty at least a couple of times a month, as they live near me. Are there any "regulars" you see? What's the key to this map? Thanks to Geoff for sending me in the direction of yet more looks at the Tube Map. 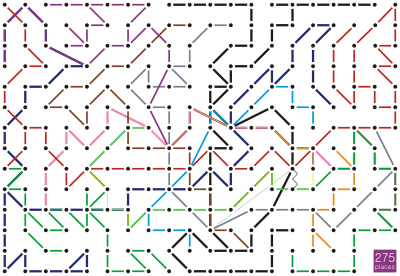 Can you work out the key to the following map from designer, David Linton? 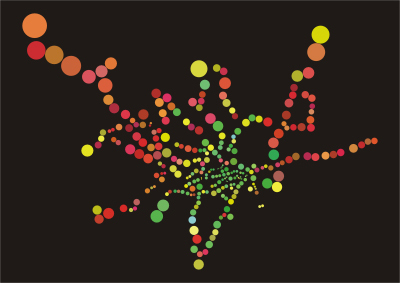 "Four years in London, geographically summarized. The Tube is London in miniature: an organic being, a glorious mess of coincidences, and our attempts to organize it with coloured lines, way out signs, and gaps to mind, ultimately only add to the chaos. I'll leave it to you to figure out the key." Also as we all know Harry Beck was challenged with straightening the lines and making the distances between more even. "A drawing for those of us who think Mr Beck just didn't go far enough. Every station is exactly 1 unit away from four other stations. By necessity, these aren't often the stations which are actually connected to it, but I have tried to make all the interconnections as short as possible. Naturally, no interconnection passes through a false grid point on the way." Bizarrely soothing to look at, but pretty impossible (for me anyway) to follow. Ian's given heads-up about a TV programme on National Geographic tonight that shows how they did it. It's part of a series called "Monster Moves". 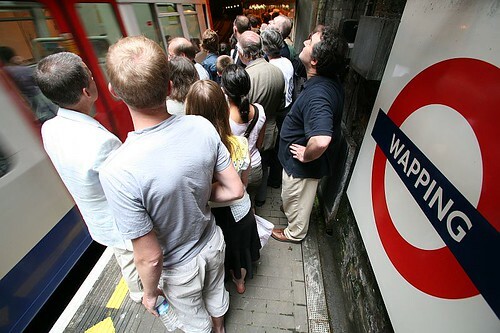 The Waterloo and City line doesn't have a rail connection to any other part of the London Underground or mainline network, so the only way of moving the 20 carriages and equipment was via a shaft on Spur Road. So if you've ever moaned if you had to take out doors and windows to move large sofas, you've had it relatively easy. Also hopefully those Laurel & Hardy stylie piano movers from Chiswick might be able to take some lessons too. Monster Moves is on National Geographic this evening at 8pm. For anyone who's not had the opportunity to go on one of innuendo ridden Thames Tunnel Tours between Wapping & Rotherhithe London Underground stations, there's another on Bank Holiday Monday. The theme is "Haunted By Brunel" and remembers May, as the month when the tunnel was first flooded. Curator Robert Hulse's normally chirpy comments are appropriately sombre for the occasion. When describing the digging of one of the oldest tunnels on the London Underground, Robert wrote: "The project took 18 years to complete, ruined Marc Brunel's health and nearly killed his son. There were five terrible floods, and some men died under the river, but drowning is quick. Some unfortunates succumbed to 'Tunnel Sickness' and were carried out, raving, to be locked in another cage at the local asylum. For some death was slow, painful and wasting: cholera, typhoid and worse. We will never know how many brave men died here." Brunel Engine House Museum will also be holding a "Haunted London" display by artist Ksenia Dudareva. The Ghost Train tours leaves Rotherhithe Tube station at 1pm, 2pm, 3pm, and 4pm. Tickets cost a fiver each. For more details and to book online visit the Brunel Engine House Museum. "Would you stop playing with that PA of yours, I'm trying to get to sleep!" 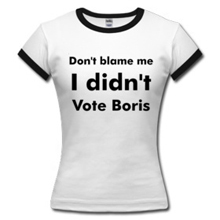 (with apologies to George Michael). 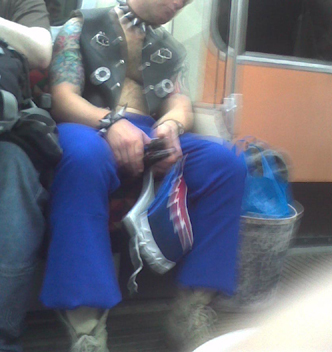 It appears the Tube is too funky for locals. Last week we heard there are too many PA announcements, now they're too noisy. Earl's Court Underground station has been served with a noise abatement notice following complaints from residents and hoteliers that that its public address system is too loud. It's the first noise abatement notice to be served on a Tube station. 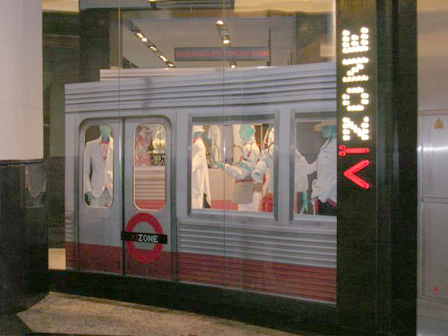 London Underground has 21 days to appeal against the abatement notice or comply with it within 60 days. If if fails to do so, the council can launch a prosecution. So what would happen then, would Earl's Court get an ASBO?